I think she's still reading the directions on the back. Then it's time to load up the pellet gun and take on her neighbourhood rivals. 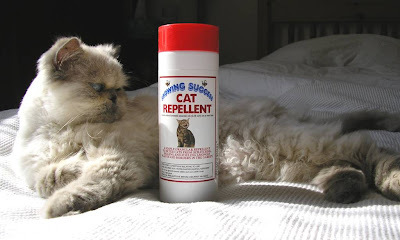 I got the cat repellent from the 99p Store last week. I forget how much I paid for it. 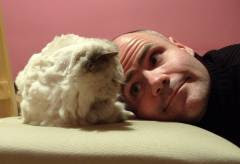 But if the DSS find out I'm wasting their money on props for blog posts, I could be in trouble. Anyhoo, if you were up and watching GMTV at 7:26 this morning (I know I was) (well ok, I video'd it), and are now wondering about the identity of the big-nosed bloke in the pink shirt and pink tie (let's just say he was in the pink), being interviewed with his family via live satellite link-up from Adelaide, Australia, about the number of people now emigrating there from the UK, well wonder no more. It was my cousin Nick. GMTV were extolling the virtues of Adelaide, which their reporter Richard Gaisford seemed to think was some kind of futuristic paradise where "high-speed buses use special rails to whizz you into the city". Yeah, they're called trams. We have them here too. But the highlight (obviously) was the extensive interview with my nasally challenged cousin. If you missed it, don't worry, I've painstakingly transcribed the whole thing and reproduced it below in all its unedited glory. Enjoy. Richard: Nick, just tell us, you do property consulting in the area, are lots of Brits coming to you at the moment? Nick: Loads of 'em. We're full all the time. Richard: And do they stay? Richard: They tend to stay. Nick: Never seen anyone move back to England yet. And people wonder why we don't have much contact with that side of the family. He could have written that on a postcard. But still, it was worth travelling half way around the world and setting up a live satellite link just to get his nose on camera. Thank god for widescreen. Anyhoo, Nick isn't the only member of the family hoping for international media exposure today. They're announcing the winner tonight of the Radio 4 Front Row writing competition I entered a couple of weeks ago. Obviously if I'd won, you'd expect them to have contacted me, but hey, this is the BBC. Those £50 worth of book tokens represent half of someone's licence fee. They're not going to send them out without a fight. I expect they're still saving up for a stamp. So needless to say I'll be tuning in at 7:15pm full of optimism. And adding Radio 4 to my revenge list by 7:45.